Shirley Jeanine (McVay) Devlin - Edmonton's Burial & Cremation Professionals | Trinity Funeral Home Ltd. It is with great sadness that the family of Shirley announces her death at the age of 83 years after a sudden, short illness. She enjoyed good health until her death. Shirley loved her family dearly and family was always her main focus. She loved playing the piano and spent many evenings entertaining her family with her beautiful music. 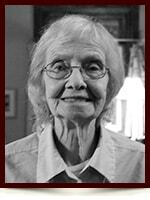 She was a lover of good movies, camping with family, classical music, and playing cards. She was a voracious reader and could hold an opinion on a variety of subjects. Shirley was the keeper of our family history as she could tell stories of our relatives and relate many detailed accounts of her childhood. She was a beloved daughter, mother, grandmother and great-grandmother. She is survived by daughters: Joan-Marie (Chris Hamilton), Jacqueline (John O’Connor); grandchildren: Kim (Chris Verge), Greg, Emily, Aisling and Aoife; great-grandchildren: Adrianna, Rhiannon and Tyler. Shirley was predeceased by her parents Vivian and Bill. The family extends heartfelt thanks to all the medical staff who helped her during her stay at the Grey Nuns Hospital.